Hi, first time poster and electronics noob so please be nice! 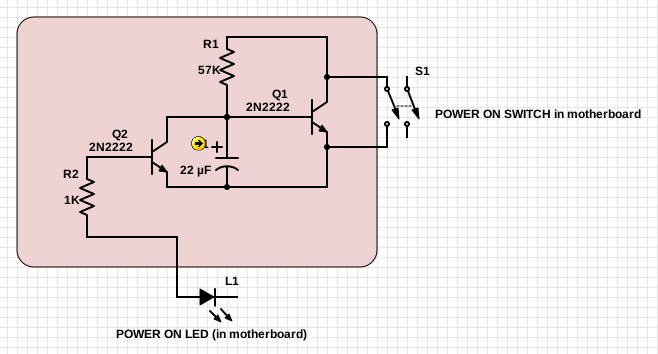 I want to build this circuit that I found on stackexchange (see picture). It is to power-on a laptop automatically after a power failure. Its for an old laptop that i'm using as a router and it doesnt have the BIOS feature to do this by itself. 1) When there is power at S1, the 22uF capacitor starts charging, via the the 57k resistor. 2) When the capacitor is charged, transistor Q1 is activated (this bit I don't understand - can someone help? ), which shorts the switch and powers on the laptop. 3) Once the power LED comes on, there is a voltage at L1 which activates transistor Q2. Now the capacitor is bypassed, and there is a shorter path to ground (through Q2) so Q1 is deactivated, opening the power switch again. I'm assuming 22uF was chosen for timing, but I'm not sure about the choice of 1k and 57k resistors. Can anyone explain this for me? I hope someone can take the time to educate me here, I find electronics so facinating! And thanks Dave for all the great videos. Q1 is an NPN transistor. It will turn on when current flows from the base to the emitter. Therefore the base must be .6V above the emitter. C1 determines how much charge is needed to reach the required voltage. R1 restricts the flow of charge into C1. Together they determine the time needed to reach the required voltage to pass current through Q1's base. R2 restricts the current into the base of Q2 so you don't blow it up. Hi, thanks for that info! Please excuse my ignorance. So does the cap actually discharge when Q1 switches on, or does it stay charged?